Nirmal Lottery NR 71 Result 1.6.2018, Nirmal Lottery Result, 1.06.2018 Kerala Lottery result, Kerala Nirmal lottery result Today, Nirmal Lottery Result 1-06-2018, kerala lottery result 1-6-2018, Nirmal Weekly Lottery NR 71 Result June 1, nirmal lottery result NR 71, Kerala nirmal NR 71 lottery result, NR 71 Result 01/06/2018, Nirmal NR71 Lottery Result 1.6.18, Kerala Weekly Lottery Result Today, Friday Lottery Result, Live Nirmal Lottery Today Results. Kerala state Weekly Lottery 71st draw (NR-71) will be held on 1-6-2018. Kerala Lottery Department will be published the Nirmal Lottery Result on 1/06/2018. Nirmal Lottery Result details, prize structure, Draw places etc are listed here below. Kerala Lottery Result Nirmal draw NR 71 result will be updated after 4:00 PM. Those who are taken the Kerala Government Lottery, Nirmal Weekly Lottery can check result of NR 71 when it is declared. Nirmal Lottery Result 1-6-2018 : Nirmal Lottery is a weekly lottery conducted by Kerala Govt lottery department. 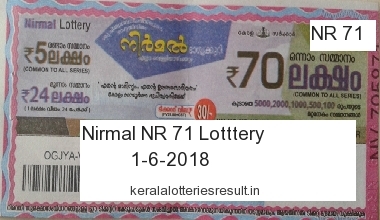 The Kerala Nirmal Lottery 71st draw will be held on 1/6/2018. Kerala Lottery nirmal result and all other Kerala lotteries results are publishing on www.keralalotteriesresult.in after the official declaration of the results. Kerala Nirmal Lottery price is Rs 30/-. The lottery will be available in five series.